IPVanish offers great speeds, plenty of servers and easy to use software. Software for Windows & Mac. Apps for Android & iOS. No UDP choice on apps. Below you’ll find my IPVanish Review 2016 discovering if their service is any good. IPVanish has been the premier VPN provider for the past year or two and have received my highest rating in both reviews in 2015 and 2013. However, the VPN industry moves fast and competition is fierce. I’ve been making use of IPVanish over the past few weeks to see if they still retain their crown or if they’ve let themselves slip and a better alternative is available elsewhere. Don’t sign up before reading on and discovering what I found. IPVanish has broken their VPN packages down into three simple options. There is one service available which includes all the features and only differs on the length of time you wish to sign up for. The longer you sign up for the greater the saving. It’s worth considering the annual package because it brings down the monthly cost to just US$6.49 (approx £4.41) per month which is a good saving over the individual monthly price. Since my last IPVanish review back at the start of 2015 they have been building their network and adding features and as such have increased the value of the service which thankfully hasn’t increased the price! On the most basic level IPVanish offer access to the PPTP, L2TP and OpenVPN VPN protocols which allows for a range of uses and covers most VPN situations. iOS users also have the bonus of being able to access IPSec and IKEv2 if required. IPVanish is available on a huge range of devices but in the simplest form they offer software for Windows and Mac and apps for Android and iOS mobile devices. If you prefer to set your VPN service up yourself then this is entirely possible and IPVanish provides guides with the required settings for a whole host of devices from OpenVPN on Windows all the way through to routers and portable entertainment devices such as the Chromebook. The Windows and Mac software are essentially uniform so if you switch between both systems then you don’t have to learn a new interface which is a great start. The desktop software is self-explanatory. A list of key areas down the left hand side make navigation easy and most of the important functions sit under their Server Selection section. Here you have access to some of the most popular options such as the fastest server and localised ones for the US, UK and Canada making it quick to connect for entertainment purposes if you want to unblock content like Hulu, Netflix, iPlayer, Pandora and others. A full List of servers is available which allows custom sorting and for visual use a global Map option is available so you can simply click on a server in a country of your choice. IPVanish offers multiple server list views. The mobile apps have been completely redesigned since my last review and simplified. The Android app basically consists of a server list that can be sorted by Response Time, Country or Server Capacity. One excellent feature is the server capacity gauge that lets you choose servers that are less or more in use depending on your preference. Connection is simple and just requires you to tap on the location of your choice and the software takes care of the rest. I would like to be able to condense the list a little into countries sections as IPVanish offer so many servers the list is a little long which is a minor niggle of mine but doesn’t effect usage. The apps are extremely minimalist making them suitable for all skill ranges and aside from selecting a server there aren’t really any options to speak of. I would like the ability to connect using UDP as it automatically uses TCP but for the majority of users that won’t really be any concern. IPVanish is one of the largest providers in terms of server locations. From my review in 2013 until now IPVanish has expanded from 44 to a massive 60 countries and added a huge amount of servers in locations across those countries. Across the 60 countries supported they have servers in 84 different cities and locations. This is great news if you want to access services from a certain country that are blocked in your country because they cover a large portion of the globe. It also makes the service suitable for access in all major continents because there will either be a server in the country you’re in or if not then one very close by. With the range of servers on offer it makes IPVanish suitable for travellers, expats, those who want to access streaming services, privacy conscious individuals and for a whole host of other needs. IPVanish allows concurrent connection on up to 2 devices allowing you any combination of desktop, laptop, tablet, phone or other type of device. IPVanish state they are a completely no-log VPN provider which for user privacy is welcomed news. No logs coupled with a pool of well over 14,000 IP Addresses that are assigned on a Shared IP basis makes the service great for those with privacy concerns. Shared IP addresses assign one IP address to multiple users meaning that your usage and traffic is mingled with other users so anyone trying to decipher who was doing what and when would have an almost impossible task. From a privacy perspective these features are critical and will limit web sites being able to track your usage and build a profile on what you access. IPVanish doesn’t discriminate against any type of internet traffic meaning you’re free to access whatever services you want including services such as Torrents and P2P across their entire server base. TV services like BBC iPlayer, Netflix, PremierLeaguePass and others are all accessible with IPVanish making them a good choice if you’re outside your home country or want to access geo-restricted entertainment services from another location. 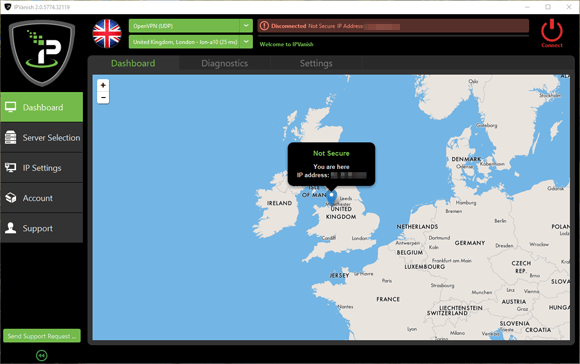 IPVanish also provides their own DNS servers when accessing via their custom clients which will stop DNS leaks. If you’re interested to know more about how DNS leaks can impact your privacy then see our dedicated DNS leak article. Speed is one of the most important factors when signing up to a VPN service, if you end up with a provider lacking in the speed department it can seriously impair your internet usage. Over the last two years I’ve closely monitored the speeds achievable with IPVanish and through our monthly published speed tests I’m happy to report that IPVanish is actually one of the fastest VPN providers available. Every month IPVanish have provided either the fastest or second fastest speed results and have been consistent for the last 14 months that we’ve been running the tests. For this IPVanish review I downloaded a 10gb test file while connected to the IPVanish network using their custom software on a Windows 10 system. OpenVPN using 256-bit encryption and the UDP protocol was used from my location in the UK. My connection speed without VPN at the time of testing was 205.47 Mbps. I really don’t even have to sum these speeds up, they speak for themselves. When you’re hitting 107 Mbps to New York and 58 Mbps to India from the UK then you know you’re onto a winner. Excellent speeds from IPVanish. IPVanish allows choosing between PPTP, L2TP and OpenVPN which all have varying levels of high-end encryption. As OpenVPN is the most secure method of connection and most popular I took a look at the encryption standards in use when using this protocol. OpenVPN makes use of 256-bit AES encryption with a 2048 bit RSA Key. This should include usage, timestamps, IPs assigned etc. Apart from your billing details no other personal information is stored about you. As IPVanish are based in the US your billing details will be stored on systems in the US. Support is available all year round 24 hours a day, 7 days per week. IPVanish offer support via support ticket and also have a forum where it’s possible to ask none personal questions. As well as contacting them directly there is an extensive support guide that will answer the most regularly asked questions. All tickets are aimed to be answered within 20 minutes so if you get stuck then you shouldn’t be waiting long for a solution. I would like to see a live chat option available considering their ticket support is available all the time. IPVanish is one of the best VPN providers I’ve used and because of this I make them one of my go-to providers for daily use. The pricing of IPVanish is mid-range but good value for money because the service they offer is greater than what is available elsewhere at the same price point. Other cheaper and even more expensive providers offer less and in comparison IPVanish excel in servers available and speed. Supporting PC, Mac, Android and iOS makes connection painless and within just a few clicks you can be connected and have your privacy protected allowing even the most novice user to enjoy the benefits of a VPN. The software and apps are well rounded but a few small tweaks here and there would finish them off well. I found their service to be suitable for entertainment services like BBC iPlayer and Netflix, downloading via Torrents and other P2P networks plus my everyday browsing use. As they offer 2 concurrent connections it allowed me to secure not only my desktop but also my mobile device at the same time. IPVanish has servers in over 60 different countries and 84 cities making them suitable for worldwide use both at home and while travelling. They are a no-log VPN provider that offer dynamic shared IPs and their own private DNS servers making their service once of the most secure and increasing your online privacy. Support is offered via a ticket system and while they are available all year round 24 hours a day and aim to answer queries within 20 minutes it would be nice to have the option of a live chat system so you could speak to someone directly and as they’re available all the time would make sense. One area IPVanish really beat the competition is speed. Our monthly testing shows them to be one of the top providers consistently and every server tested in this review provided excellent speeds even at distance from my location such as New York or India. Overall IPVanish is the best VPN provider I’ve tested. As with any provider there are one or two tiny niggles but the quality of the service, ease of use and speeds far outweigh any negatives and I have no hesitation in recommending them as my number 1 VPN provider. It should be using the VPN depending on how your set-up is. Check your IP once connected to be sure.